Chondromalacia patella (or patellae), also referred to as “runner’s knee” is a condition in which the cartilage cushioning the area under the patella (kneecap) begins to deteriorate and wear out. Due to this, the kneecap may start to rub against the femur (thigh bone) and cause discomfort or pain. This condition is often common among young athletes or sports people do to increased activity and action involving the knees. The condition can also occur in adults who are suffering from arthritis. 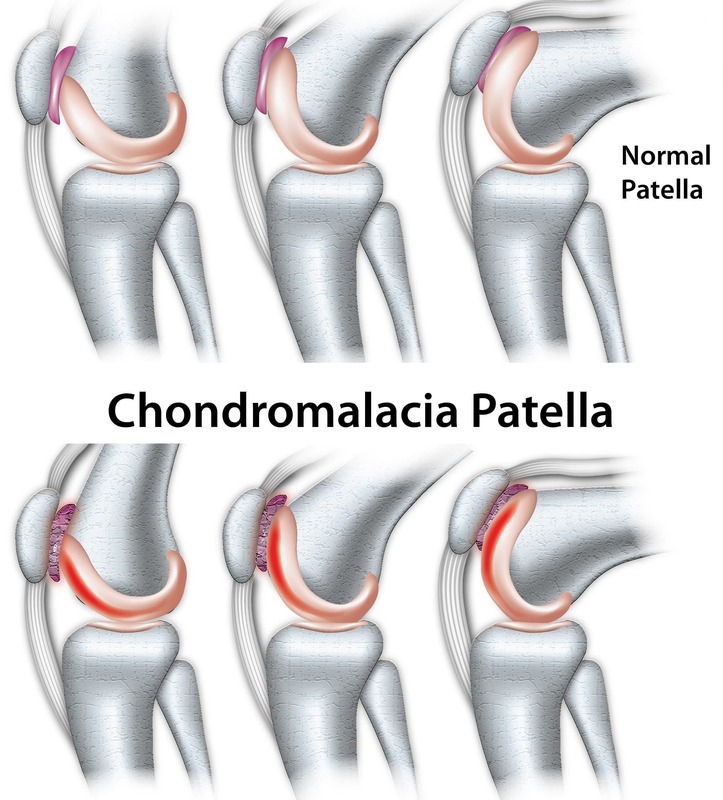 Chondromalacia patella can often occur due to misalignment of the knee or as a result of overuse, which can be seen it treated by a few days of rest. In the case of improper knee alignment, resting will not be enough and physiotherapy or surgery may be necessary to correct it. Alignment problems with the knee or foot. Gender – women are said to be more likely to develop this condition as they generally have less muscle mass than their male counterpart causing more lateral pressure on the patella. High movement – participating in sports that require a high level of movement can increase the wear on the knees and joints increasing the risk of injury. A provisional diagnosis of chondromalacia patella is usually made after an examination by a doctor or qualified physiotherapist. It is usually an active diagnosis as it requires further follow ups, due to lack of access to the cartilage. If the initial signs show no proof of damage to the cartilage then the doctor is likely to view the injury as patellofemoral pain syndrome rather than runner’s knees. Based on the results of the tests there are provided, different levels and of severity that can be experienced. MRI scan – this provides a more detailed view of the knee and surrounding joints, it is usually the most flexible method of confirming chondromalacia patella. Painkillers and anti-inflammatory medication – apart from the application of the RICE principle, the health professional may also recommend the use of NSAIDs and other anti-inflammatory medication which can aid in reducing the pain also. Physiotherapy – exercises and a range of movement to strengthen the surrounding muscles and joints can help in the rehabilitation of the knee. Improving the lateral quadriceps structure leading to the knee can help in reducing pressure on the knee and cartilage and prevent further injury to the knee. Patella taping – this treatment form can help to lessen the pain by preventing the rubbing together of the kneecap and the sore spot which causes the pain. The adhesive tapes are placed along either side of the affected knee, helping to guide and correct the movement of the patella. There are two main forms of patella taping techniques including the controlling technique for new injuries and the correct tracking technique for those looking to get back into sports activities. Knee supports specially designed for the patella can also help in relieving pain and pressure. Surgery – this is usually not common for this kind of injury and only occurs when other treatment methods or rehabilitation have proved to be unsuccessful. The surgical procedure is usually simple and involves the use of an arthroscopy or keyhole surgery, whereby the damaged or deteriorated cartilage is either removed or shaved. Wearing the correct footwear can help to improve the arch of the feet, which is particularly useful for those with flat feet. As the pressure on the kneecap is reduced, it may help with the proper alignment of the kneecap. Use of knee pads and patella supports, especially during repeated use can help reduce the likelihood of injury. Performing regular strengthening exercises can help with muscle balance, especially for the hamstrings, quadriceps, adductors, and abductors. Lowering body weight can reduce overall stress and pressure on the knees lowering the risk of chondromalacia patella. Reducing overall calorie intake and eating a balanced diet alongside regular exercising can help in keeping the knees and joints healthy in the long run.